StaffRelay‘s Worker Safety is a real time solution which enables workers, generally working alone, to use their telephone to create safety sessions and interact with an alert monitoring system. Worker Safety is designed for employees to enter specific information when they are working at a location that could be dangerous to their personal well being and relate that information to relay that information to managers and or relevant personnel, should a session go into alarm. Unlike other solutions, Worker Safety can provide both an integrated live call center and an automated approach to monitoring a remote worker’s safety. How does Worker Safety work? An employee calls into our Worker Safety application to enter specific information about their location (such as a street address, client name), what they’re wearing, what duties they’re performing, instructions to follow should their session go into alert, a person to contact, and the start time and duration of the session). The information is entered using touch tones as well as with recorded voice messages. This detailed information is then stored in a central database that monitors the session’s status. A process constantly reviews the session information, and watches for sessions that have expired without being properly closed by the worker. Under normal circumstances, a worker would call in to either close or extend the session. However, if at the end of the session, the worker had not called in, the session would go into alert mode. 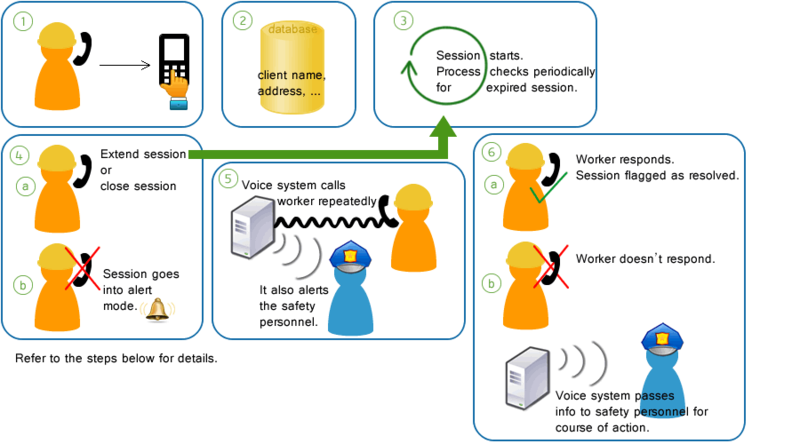 When in alert mode, the voice system repeatedly calls the worker, and updates the system, indicating to safety personnel that a session has gone into alert. Should the worker respond to the callouts, the alert is then flagged as resolved. Should the worker not respond, calls are then made repeatedly to one or more safety personnel who can determine the best course of action to ensure the worker’s well being. Using the information originally entered by the worker, Worker Safety will notify all parties of the specified location and instructions that are to be followed. Our Worker Safety application is based on a one number approach. By deploying a one-number approach, we are able to remove confusion for employees and ensure all relevant session details are recorded. We provide unique innovative solutions that can be customized to fit your business environment. Complete Telephony, Web and Live Call Center AutomationWorker Safety provides an integrated approach to handling sessions by using our automated telephony interface, our live call center, and our on-demand secure web portal to ensure remote or off-site employees’ safety is always monitored. Using the data provided by our clients through secure transmission, Worker Safety will match the employee’s ID, job, location and site to the corresponding manager, department, and supervisor for real-time alarm notifications. Our servers are kept in advanced, secure hosting facilities. Access to our servers is secure and encrypted to prevent unauthorized access. We also maintain all application and employee data in Canada.